Mmmmmm… there’s something about popcorn that makes you have to have it as soon as you smell it. Not only does it smell delicious, it’s super easy to make and even easier to buy already popped. Oh, and did I mention it’s really cheap? Giant bags of already popped popcorn can be found in the chip aisle at your local grocery store – easy peasy and under $12. Party planning with popcorn has never smelled, I mean FELT, so good. You’d be surprised by all the things you can do with popcorn, besides just eating it! Welcome to a popcorn party! Popcorn Foot Race! This is my favorite popcorn game to play. Thanks to a few of my fun friends, I was able to get some awesome action shots. For this game, you will need popcorn, string, and a plastic/paper cup. 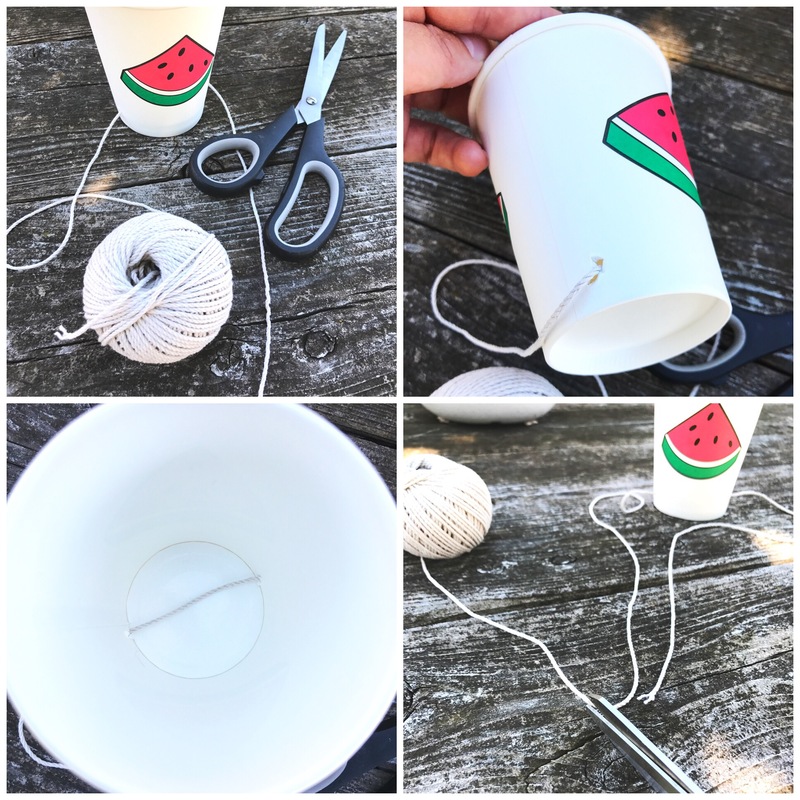 Poke two holes near the bottom of the cup and thread about 18-24″ of string through it. Tie the string around your shoe and voila! 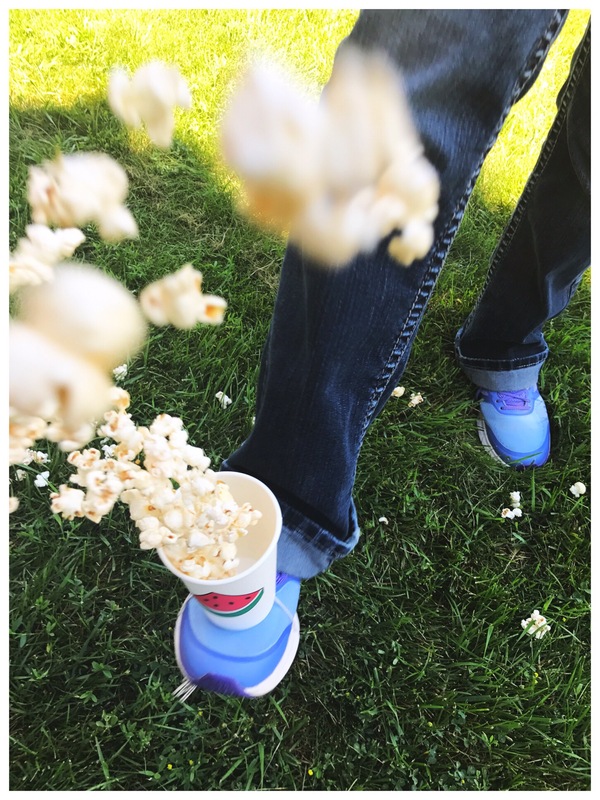 You’re ready for a popcorn foot race! You can have guests race two at a time or all at once – whatever you’d like. Have a clear start and finish line, fill the cups with popcorn, on your mark, get set, GO! Whoever has the most popcorn left in their cup at the finish line WINS! Blow the Popcorn Into the Cup! For this game, you will need popcorn, a straw, and a cup. This game is very straightforward. All you do is race a piece of popcorn across a smooth surface (like a table) using only a straw and a pair of lungs until it reaches the inside of the cup. Make the course as difficult or as easy as you’d like! Popcorn Garland! Use fishing line to string through popcorn for the prettiest garland in all the land! Popcorn Bags! I found my popcorn bags (the old-school red and white ones) at the dollar store. I have also seen them in some groceries stores. I would recommend asking a grocery worker so you’re not looking around forever and stressing out. Popcorn bags aren’t just for show and tasty popcorn, they also make for great party favor bags. A party with popcorn means good smells, good vibes, good times, and good memories at your next birthday bash. And just a few other reasons PoPcOrN RoCkS… popcorn necklaces, popcorn skirts, popcorn puppy chow, popcorn balls, popcorn and a movie, popcorn and M&M’s, Jiffy Pop, and last but not least, BIRTHDAY CAKE POPCORN (it’s amazing). Totally, shoreyj. Whatever you’re into!